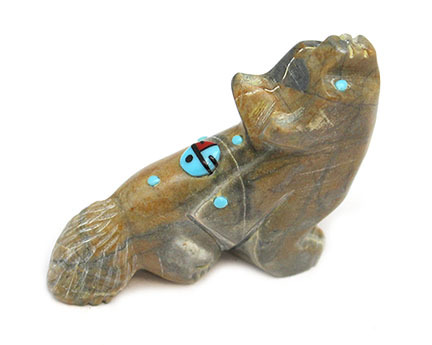 This howling wolf is carved out of picaso marble serpentine with a sunface and turquoise drops inlaid on its back. It stands about 2 1/8" tall, 1 3/8" long from tail to feet and about 1/2" wide. Carved by Zuni artisan Danette Laate. Currently only this one available.